Back last October, Professor David Harvey, presented an essay to the University of Izmir, Turkey in October. You can see a You tube screening of that presentation at https://www.youtube.com/watch?v=-ZJrNgb-iiY&spfreload=10. Professor Harvey then drafted a paper sent to me called David Harvey, Crisis theory and the falling rate of profit; to be published in 2015 in The Great Meltdown of 2008: Systemic, Conjunctural or Policy-created?, edited by Turan Subasat (Izmir University of Economics) and John Weeks (SOAS, University of London); Publisher: Edward Elgar Publishing Limited. Here is the draft, Harvey on LTRPF. and presented my response in more depth in a paper reply-to-harvey, that Professor Harvey (from now on DH) kindly posted on his own website, http://pcp.gc.cuny.edu/. I won’t repeat the arguments presented in DH’s paper and my reply – you can read them yourself. Suffice it to say that DH was arguing that in essence, that Marx’s law of the tendency of the rate of profit to fall (LTRPF) is not the only or even the principal cause of crises. Thus it cannot be the basis of a Marxist theory of crisis. Indeed, “there is, I believe, no single causal theory of crisis formation as many Marxists like to assert”. Harvey argues that we proponents of Marx’s law as the basis of a theory of crises are one-sided and monocausal in our approach because: “proponents of the law typically play down the countervailing tendencies”. Moreover, Professor Harvey pours cold water over the “array of graphs and statistical data on falling rates of profit as proof of the validity of the law”. He doubts their validity because there is plenty of evidence in the ‘business press’ that the rate of profit, or at least the mass of profit, in the US has been rising, not falling. Professor Harvey prefers other reasons for capitalist crises than Marx’s law. There is the effect of credit, financialisation and financial markets; the devaluation of fixed constant capital in the form of obsolescence; and, above all, the limits on consumer demand imposed by the holding down of real wages relative to capitalist investment and profits. He wants us to consider alternative theories based on the “secondary circuit of capital” i.e. outside that part of the circuit to do with the production of value and surplus value and instead look at that part concerned with the distribution of that value, in particular ‘speculative overproduction’. AK has delivered an effective and enlightening rebuttal of DH’s arguments. Then AK makes the point that I also make in my reply that “the data do indeed suggest that the mass—the absolute amount—of surplus-value or profit increased. But the issue here is what happened to the rate of profit, the amount of surplus-value or profit as a percentage of the volume of invested capital. An increase in the numerator of a ratio (rate) is not evidence that the ratio as a whole has increased. If the percentage increase in the denominator of the rate of profit, the invested capital, was greater than the percentage increase in the numerator, then the rate of profit fell. Given that Harvey does not show, and does not even suggest, that the denominator failed to increase by a greater percentage, the statistic he cites is just not evidence that the rate of profit rose”. And as I said in my reply to DH (and DH is open about this), AK points out that DH is really just backing the view of Michael Heinrich that Marx’s law is not a law at all; that any way it is ‘indeterminate’ and was eventually dropped by Marx as the ‘most important law’ in political economy because it did not work (see my post, https://thenextrecession.wordpress.com/2013/05/19/michael-heinrich-marxs-law-and-crisis-theory/). Both G Carchedi and I (http://gesd.free.fr/mrhtprof.pdf) and AK in recent papers (http://gesd.free.fr/klimanh13.pdf) have dealt with Heinrich’s arguments. But of course, that has not ended that attack on the relevance of the LTRPF as the underlying causal explanation of recurrent crises under capitalism. Indeed, only recently, Saso Furlan, a Marxist student from the Slovenian Institute of Labour Studies and a prominent member of the Initiative for Democratic Socialism party that recently won seats in the Slovenian parliament, has written an article accepting Heinrich’s position in full (http://drustvenaanaliza.blogspot.de/2015/03/on-law-of-tendency-of-rate-of-profit-to.html?m=1). In a very eloquent response, full of interesting observations, DH takes up the metaphor used by AK and, of course, used by Marx himself on several occasions, that the Marxist theory of value and the LTRPF is really like Newton’s law of gravity. The law of gravity means that on earth objects will tend to fall to the ground. Of course, such a fall can be delayed by wind, or by constructions, etc, but the tendency is there and explains the ultimate movement of objects. Using this quote, DH wants us to think that Marx saw crises as a result of ‘mutual interaction’ between different parts of the circuit of capital: production is determined by ‘other moments’. Thus the causal sequence is not ‘mono-causal’ or one-way: from the profitability of capital to investment and production and then consumption, but is one of ‘mutual interaction’. But if we look closely at the quote, we can see that this is not the correct interpretation. Marx says “a definite production thus determines a definite consumption, distribution and exchange as well as definite relations between these different moments”. Only in a “one-sided form” is production determined by other moments. Production leads and sets off a chain reaction that feeds back on production in a crisis. The trouble with his metaphor of a human body that gets sick, in contrast with Marx’s metaphor of gravity, is that DH replaces a clear causal sequence from profitability to crises that can be tested and measured with a view of a vague variety of contingent forces within the organic whole that move one way or another depending on the interplay of multiple but correlated contradictions. There is no explanation of where these crises come from. DH tries to contrast his metaphor of a “chaotic mishmash of possible causes for breakdown and crises that I typically invoke without any necessary directionality of change with the mechanical certainties of that Newtonian world in which the clock was wound up at the outset through the extractions of absolute surplus value only to gradually be wound down under the competitive impetus to create relative surplus value. As the ratio of capital to labour employed shifts ineluctably in the former’s favor so the profit rate trends down. To me, this mechanical model appears too deterministic, too unidirectional and too teleological to fit how I see and experience capital evolving as an organic whole”. DH also resurrects the old argument that even if the LTRPF is relevant to crises under capitalism, it is really only relevant to a long term apocalyptic end or breakdown. “Yes indeed the sun will eventually run out of gas and given the second law of thermodynamics energy will dissipate. But there is nothing to stop the increasing concentration and, in the earth’s case, storing of energies in one part of the universe for a time so that species as well as whole civilizations can be constructed through increasing order.” But “in the here and now the second law of thermodynamics means very little to us at the macro-level struggling to reproduce in our little corner of the universe, even as it is a universal feature of the world in which we live (and has lots of localized uses in closed systems such as in steam engines)”. This metaphor that Marx’s law only operates at the same level as the laws of physics that predict that the sun (like other stars) will eventually burnt out in a billion or more years, so that it is irrelevant to crises in human life times is pinched from Rosa Luxemburg, who adopted an underconsumptionist theory of crises (as does DH in some places – see mattick on harvey). Luxemburg addressed a ‘mono-causal’ LTRPF supporter of her day in ironic tone, as follows “there is still some time to pass before capitalism collapses because of the falling rate of profit, roughly until the sun burns out!” Rosa Luxemburg Anti-Critique, p. 76n. DH offers no evidence to test his ‘multi-causal chaos’ theory of crises while proponents of the LTRPF as the underlying causal driver of recurrent crises can and do just that. AK provides powerful evidence in the second part of his reply to DH. And I and others like G Carchedi, Esteban Maito, Alan Freeman, Tapia Granados and more have also generated empirical evidence to test and confirm or falsify Marx’s law. The result is that Marx’s LTRPF does fit the facts as the best explanation of recurrent crises. As AK explains in his second part, we can decompose the movement in the rate of profit to see if it matches the assumptions of the law in reality. Thus Marx’s law says that the rate of profit will fall if the organic composition of capital rises faster than the rate of surplus value. Marx’s law says that if the rate of surplus value rises faster than the organic composition of capital, then the rate of profit will rise. But this latter countertendency is just that – it will be weaker than the tendency for the organic composition of capital (OCC) to rise. So over time (and not time as long as it takes the sun to burn out! ), the rate of profit will fall. The evidence presented by AK and others for the US is conclusive on this. Here is some more evidence from my calculations on the latest data on the US rate of profit (see my post, https://thenextrecession.wordpress.com/2015/03/27/profit-warning/). So there is a secular decline in the US rate of profit from 1946 to 2014. The rate of profit did fall well before the sun burnt out. The reason is clear. 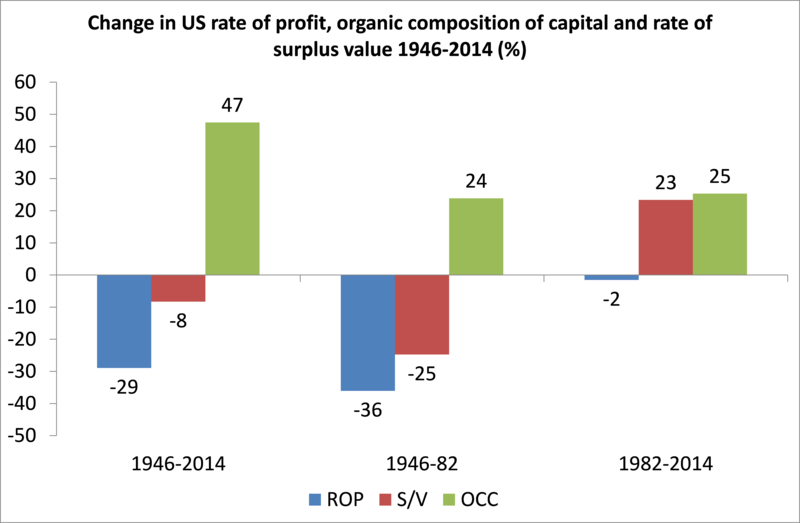 Between 1946 and 2014, the organic composition of capital rose 47%, while the rate of surplus value actually fell 8%, so the rate of profit fell 29%. In the neo-liberal period after 1982, the rate of profit fell only very slightly, because the ‘countertendency’ of a rising rate of surplus value was nearly enough to match the rise in the organic composition of capital. G Carchedi in an unpublished paper looked at just the productive sector of the US economy. He found that, from 1947 to 2010, the rate of exploitation actually fell, which shows the limits of growing exploitation as a counter-tendency. And the rate of profit (ARP) fell. In the graph below, the wages to profits ratio (W/P) – the opposite of the rate of surplus value – rises up to 1985 and then reverses (modestly). And the rate of profit consolidates. The increase in the rate of profit from the mid-1980s was really just a slowing down of its secular fall. And the decrease in W/P since the mid-1980s (increase in the rate of exploitation) is actually a slowing down of its secular increase, i.e. of a decrease in the rate of exploitation. This shows that, given the persistent increase in the OCC, (i.e. given the persistent fall in surplus value relative to the capital invested) over the long run, the rate of exploitation cannot but decrease. But does a falling rate of profit lead to crises as Marx argued and we mono-causals also reckon? Well, again the evidence is strong. Indeed, I know of no Marxist economist, except perhaps DH, who does not doubt that it was a crisis of profitability in the 1970s in the major economies that led to the first simultaneous international slump in 1974-5 and the double-dip recession of 1980-2. And that includes those economists like Gerard Dumenil, Michel Husson, Sam Gindin etc who reckon that the LTRPF had nothing to do with the Great Recession. It even includes the so-called post-Keynesian economists who reckon that the slumps of the 1970s and 1980s were ‘profit-led’ (ie wage share rose and drove down profits), although this school now reckons the current crisis is ‘wage-led’ (i.e. wages are too low for effective demand). See my post, https://thenextrecession.wordpress.com/2014/03/11/is-inequality-the-cause-of-capitalist-crises/. And I have also shown how changes in the mass of profit will be followed (not led) by changes in investment. Well. some of us have done just that. In various papers I have looked at the connection between the time of the turnover of fixed capital and the regularity of cyclical crises. I argued in my book, The Great Recession, that the 13-16 year period for a change in the direction of the rate of profit does correlate with the age of US fixed assets. Esteban Maito and Peter Jones have also considered in detail the role of the turnover of capital in recent papers. DH concludes that “I would claim my organic metaphor for understanding capital’s nature works far better for understanding what is happening to us in the here and now.” Well, let’s raise another metaphor: that of a pinball machine. The ball could represent the accumulation of capital. It whizzes round hitting various obstacles in a chain reaction. They light up, representing various crises, each slightly different. One crisis bounces onto another (from housing to stocks to banks etc), as in Harvey’s metaphor. But the pinball machine’s raison d’etre is that its level slopes down so that gravity takes over; that is the essence of its working. The ball is always tending to drop to the bottom and even intervention by levers from the outside (government action) cannot stop that tendency which eventually overrides the obstacles and levers and the ball drops into the hole at the bottom. Accumulation stops. Of course, metaphors have their limits but, I think, this one works well to understand the ‘here and now’ of capitalism. This entry was posted on April 2, 2015 at 9:15 am and is filed under capitalism, economics, marxism, Profitability. You can follow any responses to this entry through the RSS 2.0 feed. You can leave a response, or trackback from your own site. Since David Harvey is keen on biological metaphors, it would be entirely appropriate for him to recollect his namesake’s work and start thinking of production as the beating heart of capital, driving its circulation. Read the prologue to Harvey’s The Enigma of Capital. You don’t have to be a fan of Harvey to enjoy it; it’s very well-written and I can’t remember reading a metaphor of political economy that I enjoyed so much. I must say that Paul Krugman and Larry Summers are doing better better job of defending the Marxian idea that low rates of return on new or marginal investments than self-proclaimed Marxists. Harvey is actually much behind them. Could you furnish citation to Marx quote? Put a distinctive phrase into a Web search engine, for example, “the vital flame of production” . Use the quote marks. Capital, volume 3, Chapter 15. Bit coin really? I’m really starting to wonder if Syriza is going to last the year. Oh, well I’m still not sure of Syriza’s survival. In the following methodological section of the introduction, Marx comments that “the concrete is concrete because it is the concentration of many determinations, hence UNITY of the diverse” (101, My emphasis added). In what sense can we think of production as a “concentration of many determinations” and “unity of the diverse?” It would be insufficient to take production in “its one-sided form” as this candidate, because Marx seems to be describing here the way in which production is determined by exchange and consumption. This one-sided form of production is a “concentration of many determinations” but it is not a “unity of the diverse” because it excludes the way in which production determines the other moments of the circuit of industrial capital. What then, if we consider the reproduction of the capitalist economy? In simple reproduction it seems arbitrary to assign any particular importance to any one moment of the circuit of industrial capital. Because we are dealing with a static system we can argue that any one moment is just as important as any other. However this is no longer possible when we consider expanded reproduction because expansion MUST originate in production (production is by definition the site of expansion). Expanded reproduction is both a “concentration of many determinations” (It comprises all the moments of the circuit of industrial capital without exhausting their contents in its own definition) and a “unity of the diverse” (It unites these moments in an intelligible whole). It also demonstrates the predominance of production, and therefore I believe it is a reasonable candidate for the “all-sided” form of production that Marx is referring to. Harvey seems to have realized the problem that this poses for him, because he explicitly denies the priority of production in his discussion of the reproduction schemas in his commentary on Capital Vol. II, where he strongly criticizes Marx for placing the site of expansion in his expanded reproduction schema in Department I (Means of production) instead of Department II (Means of consumption). He argues that this is a mere “bias”, and that “Marx does not prove the necessity of this priority as a universal truth” (359). He argues that at the most, this bias is a result of the capitalist drive for the accumulation of surplus value, and that it strongly “underpins” the thinking of socialist governments in prioritizing the development of heavy industry. It may be the case that an over-prioritizing of HEAVY INDUSTRY has a negative influence on the well-being of the working class and on development, but this says nothing whatsoever about the relative priority of production. Harvey here seems to be arguing against placing a priority on economic expansion, which makes perfect sense given that simple reproduction appears to render the priority of production arbitrary (As I mentioned above). Gravity explains why the apple falls to the ground, not why it leaves the tree! The falling profit rate is a factor, among others, of a capitalist system. Obviously. Marx looked at the very reliable stats of his day that showed the organic composition of capital. Those stats showed, I think I am correct in saying that during the 18th century constant capital went from being 50% to more like 85% and during this period the rate of profit fell. Marx made the link. I think he does this in capital volume 1. The problem is that during this period the power loom replaced the hand loom (and other things), and the affect was incredible, i.e. technology had a dramatic effect. The problem is that subsequent technological affects have been more marginal, and therefore Marx backed off from raising falling profits as a law to more of a tendency. Of course the computer revolution could be another period where the technological affect becomes massive, but I don’t think it compares to the conditions of the 18th century. You can’t conclude this from the law as such – that is a definition – that one tendency will weaken in relation to another over an undefined period of time. Another relationship between the rate of surplus value and the OCC is needed – I know some have concluded that the rate of surplus value is limited (by hours available) whereas there is no such limit to a rising OCC but this is at the limits that are never reached. Re: Heinrich, he just doesn’t get the point that socially necessary labour time (snlt) is embodied in ALL commodities, including the individual worker’s skills, skills which are being sold to an employer for their market price. He does see that commodities are exchanged on the basis of their snlt; but his emphasis on the act of exchange makes him deny the fact that without snlt the good or service would not exist in the first place to be compared for exchange. Thus, he does not take into account the fact that an electrical engineer’s skills sell for a higher price than a worker who has no skills and only a high school education because the engineer’s skills have more socially necessary labour time embodied them than the unskilled high school graduate does. This error leads to many, many errors in his INTRODUCTION TO MARX’S THREE VOLUMES OF CAPITAL. He seems to confuse the abstraction of price with value, the socially necessary labour time embodied in a commodity, pretty consistently. I must be missing something but on that last chart it appears that investment turned up before profits circa late 2009. Just saying. Paul You are missing something. 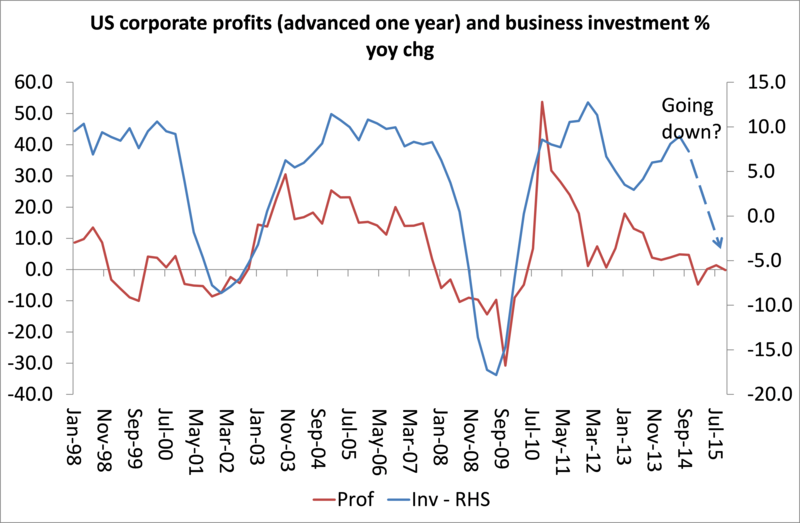 I have pushed the corporate profits line one year ahead so that you can see whether it is likely that the investment line will start to fall too, one year later. If I kept both lines at the same time point, then the red corporate profits line turned up before the blue investment line in circa 2009. But because the gap between the two then was less than one year, the graph in the post has misled you. It would be nice if Marxists could agree on whether profit has exploded or gone down before we can say this for sure! And you guys have access to the same data! If we want the use the evidence we can conclude this, capitalism can endlessly reform itself despite of, or perhaps because of the tendency of profit rates to fall. So even if the theory is true, so what? My own view is that when Engels said their socialism was built on the inevitable demise of capitalism, they were not talking about profit rate but about the systems gravediggers, the proletariat. After all history if not the history of technical aspects of a system, but a struggle of classes. The point I think is that system of gravediggers, the CLASS, embodies the condition of labor,– wage-labor– which is at the core of capitalist accumulation. Does the aggrandizement of relatively more surplus labor time; the reduction of necessary labor time lead to, over time, a reduction in the ratio of “new value” to the total capital deployed? The evidence clearly confirms that tendency. There is a material reality to the conflict between means of productions and relations of production which drives the class struggle. To preserve the latter, the bourgeoisie have to “attack” the former. The issue is not “does the tendency of the rate of profit to decline in and of itself determine the end of capitalism?” But rather, does the condition of labor that leads to that decline compel the class of laborers to seek the abolition of that very condition? It probably has an affect but one among many? Thanks for this interesting post. What I’d like to ask is how the debate is proved either way by these graphs? A lot depends on what time period you choose. 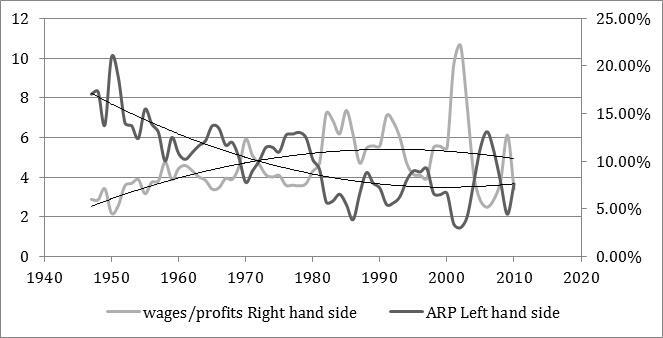 For instance, from 1960 onwards – maybe a quarter of world historic capitalism – the long term trend lines in the w/p and ARP graph would be fairly flat, albeit with plenty of ups and downs, and you could argue that the raised bit before 1960 is down to the exception of postwar reconstruction. Similarly, take the dotted line projection out of the profit and investment graph and that would be fairly flat too, excepting the two crashes. Add in all the usual qualifications about differently collated statistics and margins of error and I can’t see how these graphs and the numbers behind them can be conclusive evidence. The thesis of the LTRPF implies that the crisis are the result of the process of increasing composition of capital along the say 7 or 10 or 15 years between them. Now, I was reading Marx and he also referred to recurrent overinvestment/overproduction. So, is there a relation between them? Because, for example, the standard view is that the past crisis was the result of a boom or bubble in housing. Secondly, some may think that there is some confusion between overinvestment and underconsumptiom. It seems to be two different things: Overproduction in housing does not imply underconsumption in housing. The rate of self-expansion of the total capital, the rate of profit, being the goad of capitalist production, its fall checks the formation of new independent capitals and appears as a threat to the development of the capitalist production process. It breeds over-production, speculation, crises, and surplus-capital alongside surplus-population. Does Marx then connect the fall in the rate of profit with overproduction, speculation, etc.? How? He does not specify. Hypothesis: The increment in the composition of capital is united with the increment with the productivity and the mass of invested capital so that contributes to such fact. In truth, Marx does– link LTRPF with overproduction, and then again he doesn’t. He regards overproduction of “multifaceted”– that is it can appear in isolation, in one sector of the economy, and it can appear in its “epidemic” form. I can remember reading Marx’s passages on overproduction and wanting, wishing, almost willing him to make the connection to the LTRPF, and being, for the most part disappointed that he doesn’t– but then there’s always Chapter 15, Volume 3 of Capital– Development of the Law’s Internal Contradictions where he discusses the overproduction of capital, refuting the notion that somehow can be distinct and distinguished from the overproduction of commodities. He writes: “It [overproduction of capital] is an oveproduction of the means of production only in so far as **these function as capital**, and hence have to produce an additional value in proportion to their value that has expanded with their mass; i.e. have to valorize their values. While I realize that AK and MR are much ‘truer’ to Marx than DH (who seems more interested in expounding his own ideas than interpreting those of Marx) and that they better understand their subject matter (LTFRP), I think DH does, at times, make some very valid arguments, many of which are ignored by Marxists angry at him for not being Marxist enough (his celebrity status has something to do with this). 1. Urbanization and industrialization are possibly the key engines of economic growth, and they can only happen once. ‘Urban redevelopment’ and gentrification is the only way to try and replicate this process, and it’s a topic of particular interest to DH. The first world economies finished these developments decades ago, and since then, have either had to rely on external demand, labor cost-cutting, or asset bubbles for economic growth. Additionally, these processes are very far on their way in India, China, and the rest of the developing world. Only Africa has yet to undergo them on a wide scale, but its entire population is less than that of India’s. (Robert Gordon is another author who notes that certain developments can only occur once–in this case, he focuses on technological revolutions–but MR doesn’t seem to comment on this idea in the posts where he discusses Gordon’s work). 2. After the reconstruction of western Europe and Japan, by the 1970’s, the world reached a crisis of overproduction and under-utilization of capacity in manufacturing, best chronicled by Robert Brenner’s work. Since then, developed economies have only been able to achieve growth by cutting labor costs and blowing asset bubbles. But MR has never even mentioned Brenner other than once in passing last year. It seems obvious that both of these points play a key role in the current crisis. And they can be reconciled with the LTFRP; those who want to see the current crisis in terms of the LTFRP can simply note that these developments played a key role in exacerbating the LTFRP in this era and explain why the current crisis is so severe. Another argument that DH discusses at length is that capitalism requires infinite growth while the amount of people and resources on earth are finite. And at a 2-3% growth rates, the global economy will double in the next few decades, and continue to double at an ever increasing rate (compound interest). With China and India already quite integrated into the global economy, there seems to be little evidence that there is enough potential to realize growth at such a pace. From what I’ve read on this blog, MR believes that after a long depression, capitalism is bound for another boom. I don’t think long-term, sustained growth rates at 3% are possible without a great bout of creative destruction (e.g. a massive war). As DH notes, the world is already awash with capital that has no profitable destination for investment (also in part thanks to financialization, trends that I think AK and MR could pay more attention to), and the continual growth of capitalism at normal rates would mean these problems would only worsen exponentially. One other thing that I think AK and MR get wrong is their insistence that real wages have not declined in this era. I think they’re pretty much the only people aside from right-wingers who think so. The fall of organized labor, the disappearance of the middle class, the rise of finance capital, and the entrance of billions from India and China to the labor market are some pretty big clues, as is the fact that cheap, easy credit has been taken on by the popular classes on such a large scale (DH rightly notes that this is capitalism’s mechanism to compensate for the fall in their purchasing power). I don’t see how this is irreconcilable with the LTFRP; in fact, I always thought that it was an inherent part of the process. Automation and increases in productive capacity mean that less labor is required to produce the same amount, and since we must assume that demand is constant, this means less employment (and an ensuing fall in wages and demand). Perhaps MR or one of his followers of this blog can fill me in on that one. My upcoming book on this Long depression and many posts here, I think, suggest that I have considered the current historical conditions and their specific characteristics in relation to the LTRPF. See my paper, Tulips, triggers and tendencies 2014 Amsterdam, for one. see https://thenextrecession.wordpress.com/2014/02/16/tendencies-triggers-and-tulips/ Also my paper, A world rate of profit also goes into the role of globalisation (re your para no 1). My paper on Debt matters, deals with the role of credit in this current crisis. Re para 2 on Robert Brenner, I think RB makes an important contribution and he too argues that the cause of crises is to be found ultimately in profitability, although he does not accept the LTRPF as the theoretical basis, I think. Yes, both 1) and 2) can not only be reconciled with LTRPF but can be explained by it. My argument about a capitalist recovery after this long depression is open to discussion but, exactly, it wont be possible without another bout of capital destruction (not necessarily achieved by world war though). Real wages have not fallen in absolute terms for the average in the last 30 years, although they have stagnated in some countries. But they have been augmented somewhat by the ‘social wage’, transfers etc. What has happened is a rise in the rate of surplus value in the neoliberal period counteracting the LTRPF with relatively brief and limited success. As you say, all these recent developments are compatible with LTRPF and indeed are explained by it. The point is that David Harvey does not agree and argues that LTRPF has nothing to do with it. Instead he looks for anything but the LTRPF to explain things. Perhaps you could ask him again to fill you in on that one. My article in the Review of Radical Political Economy, March 2015, on the materialized decomposition of capital, C/(v+s), presents data that it has been stable around two (2) in the U.S. since 1955. Unproductive labor is included in the calculations. The implication is that C/v would be rising over that time period due s/v raising since C/v = C/(v+s) times (1 + s/v). Would you comment on this from an article in Monthly Review 2015, Volume 66, Issue 11 (April) / If You’re So Smart, Why Aren’t You Rich? by Michael Lebowitz? And don’t neglect the comment section(s) of both Michael’s and Andrew’s pieces. Thought provoking, all.